Compact and Powerful portable air compressor. 12volt, Permanent Magnetic Motor, Duty Cycle: 15%@100PSI, Max. Working Pressure: 100 PSI, Max. Amp Draw: 14 Amps, Min. Ambient Temp: -4 F, Max. Ambient Temp: 176 F, Stainless Steel Braided Leader Hose, Dimensions: 6.57"Lx3.66"Wx6.18"H, Net Weight: 5.3 lbs., Oil-less Design, High Performance PTFE Piston Ring, Stainless Steel Valves, Moisture and Dust Resistant, Gearless Direct Drive Motor., Anodized Aluminum Alloy Cylinder, Automatic Reset Thermal Overload Protector., Heavy Duty Steel Stand with Vibration Isolators, Deluxe Carry Bag, 3-pc Inflation Kit, 150 PSI gauge, Cigarette Lighter Power Plug with 15 amp inline fuse holder. 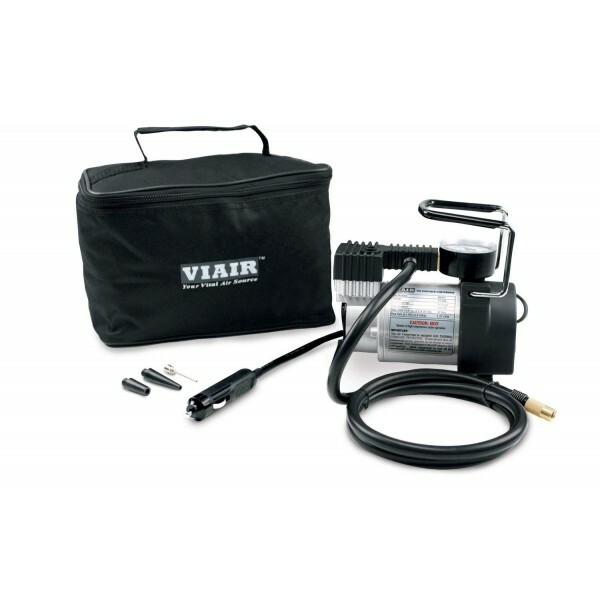 16ft cable length, 4ft air hose.70P is a small but powerful portable compressor kit that is capable of inflating up to 25-Inch and smaller tires easily by simply plugging into your cigarette lighter power port, connecting to a valve stem and turning the unit on. Tire pressure can be monitored using the gauge mounted on top of the unit.70P Amp Draw Warning: Most automotive cigarette lighter/power ports handle up to 15 amps. Some vehicles' power ports may have even lower amp ratings. Before purchasing and using this unit, inspect the amp draw limitations of your vehicle power port. The 70P Portable Air Compressor requires a power port rated for 15 amps. Never replace fuses of higher amp rating beyond the original rating of the circuit. Consult your vehicle manual for further details. VEHICLE/CAR MUST BE ON WHEN USING THIS AIR COMPRESSOR, IF NOT ON, THE FUSE WILL BURN OUT. Included One number VIAIR tire inflatter.